The Siberian Stonechat or Asian Stonechat (Saxicola maura) is a member of the Old World flycatcher family Muscicapidae. In the past it was usually classified as a race of the Common Stonechat, Saxicola torquata maura, but recent genetic evidence strongly supports its status as a full species, Saxicola maura distinct from the African Stonechat (Saxicola torquata sensu stricto) and the European Stonechat (Saxicola rubicola). The Siberian Stonechat is migratory and insectivorous. It breeds in open rough scrubland and rough grassland with scattered shrubs. The breeding range covers most of temperate Asia, from about 71°N latitude in Siberia, south to the Himalaya and southwest China, and west to eastern Turkey and the Caspian Sea area. It also breeds in the far northeast of Europe, mainly in Russia, but occasionally as far west as Finland. The wintering range is from southern Japan south to Thailand and India, and west to northeast Africa. On migration, small numbers reach as far west as western Europe, and exceptionally as far east as Alaska in North America. It resembles the closely related European Stonechat, but is typically paler, with a white rump and whiter underparts with less orange on the breast, and with distinctly longer primary feathers in the wing. In this last feature it more closely resembles the Whinchat, in both an adaptation to long-distance migration. 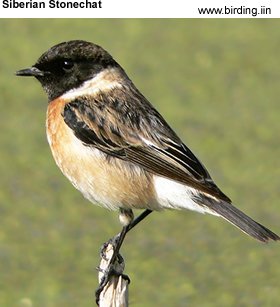 The summer male has black upperparts, lacking the brownish tones of the European Stonechat, a conspicuous white collar, white scapular patch and white rump, a restricted orange throat and black head. The female has pale brown upperparts and head, and white neck patches (not a full collar) and a pale, unstreaked pinkish-yellow rump. The male has a clicking call like stones knocking together. The song is high and twittering like a Dunnock.